Problem identification includes two different kinds: before the fact and after the fact. Before-the-fact problem identification entails discovering deficiencies before they have an impact on performance, before they result in deviations. This kind of problem finding requires a forward-looking problem-solving style and generally includes a change audit, a decision audit, an implementation audit, a resource audit, and an activity audit, according to Alfred W. W. Schoennauer in Problem Finding and Problem Solving. The change audit examines changes in a company's environment, decisions, resources, and tasks to uncover any aspects that might lead to future problems. For example, the entry of a competitor in the business environment could lead to reduced sales and hence reduced profits. The decision audit reviews company decisions for their consistency with the environment, resources, and activities as well as with each other. Using the implementation audit, a company can determine if it thoroughly implements its ideas and policies and if it effectively communicates information about its implementations. The resource audit can identify potential problems by detecting any inadequate resource allocations that may impede company goals and expectations. Finally, the activity audit seeks to determine if company activities are conducted in conformance with plans and goals. Results analysis: determining the deviations from the goals and expectations. Activity-interaction analysis: discovering inadequate activities and conduct that could cause the deviations. Resource analysis: uncovering resource deficiencies. Environmental analysis: discovering environmental constraints and threats. Decision analysis: determining if decisions fail to account for various environmental, resource, and activity factors. 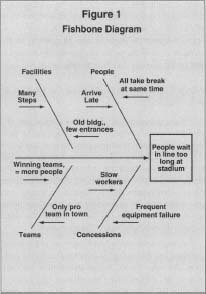 The Ishikawa fishbone or cause and effect diagram can be used to represent the problems and to help identify their causes. All of the possible major and minor causes of the end effect are enumerated along the "bones" of the diagram. Major causes might be environment, equipment, funds, methods, personnel, or training. Then all of the possible causes are evaluated to see if they might cause the problem under consideration. A potential difficulty is that it may be difficult to identify the actual cause of a specific problem with this diagram. Figure 1 shows an example of a fishbone diagram. Whatever method a company uses to identify problems, it must make sure that it discovers actual causes and not "red herrings" or things that superficially resemble causes at first glance. Hence, the first step of problem solving involves ruling out possible causes to arrive at actual causes, which may entail sorting through a quagmire of possible causes and effects. At the heart of finding the best solution is weighing the pros and cons of possible solutions, by finding potential solutions to a problem, identifying the positive and negative aspects of each solution, and choosing the best solution based on these considerations. This method assumes that both the problem and the potential solutions are already well identified. While using a list of pros and cons is simple and requires little expertise, more complex problems require more sophisticated approaches. A more intricate method of identifying potential solutions is Fritz Zwicky's morphological approach, in which a two- or three-dimensional matrix is used to force the consideration of possible solutions that might otherwise be overlooked. Also employed to identify solutions is Edward de Bono's use of "lateral thinking" to generate unconventional new ideas. This has some similarity to Roger Von Oech's "whack on the side of the head" approach to thinking of problems and their effects in unconventional terms. De Bono summarizes traditional approaches to problem solving as digging a hole deeper, and lateral thinking and related approaches as digging a hole elsewhere. In The Act of Creation, Arthur C. Koestler explained these approaches using the concept of "bisociation," which refers to the intersection of two incompatible but internally consistent frames of reference that can lead to a solution that would otherwise not be discovered. He showed how all of humor, most of literature and art, and nearly all breakthrough scientific discoveries can be traced to the occurrence of bisociation on the part of the creator. Hence, lateral thinking and related approaches to problem solving develop alternative problem-solving strategies, whereas vertical approaches simply follow a single strategy. Synectics, developed by William J. J. Gordon and George M. Prince, is an approach that deals with the stages of identifying solutions and overcoming obstacles to carrying out a solution. In the synectics approach, a team working on possible solutions to a problem takes an "excursion" into a fantasy environment somehow related to the problem. The ideas developed in the fantasy environment, using an open form of team participation, are then translated back into the real-world environment of the problem to become potential solutions. This consideration of the problem in a fantasy context allows the team to develop solutions that would otherwise not be discovered. Synectics also involves using analogies and metaphors to develop creative ways of developing solutions. The use of decision trees can help problem solvers determine the merits of competing solutions. Decision trees show, in detail, the sequence of actions and events that will follow from an initial decision point, where one of a number of alternative actions can be taken (see Figure 2). They present different solutions and their implications in a manner that allows problem solvers to compare easily the costs and benefits of each decision. Decision trees include two elements: squares, which represent decision nodes, and circles, which represent chance nodes. The chance nodes refer to the points where decision makers do not have control over the outcome. Hence, the squares represent points where decision makers have choices and the circles represent points where they have no choices. The decisions and chance outcomes are arranged so that they represent the order they could occur in. The sequences of decisions and chance events can then be evaluated using expected monetary values based on the probability of the various outcomes. While there are numerous formal and informal, theoretical and anecdotal, approaches to problem solving, the Kepner-Tregoe method, the theory of inventive problem solving (Triz), and the theory of constraints "thinking process" approaches stand out as either widely accepted (Kepner-Tregoe method) or growing in popularity (Triz and the theory of constraints). THE KEPNER-TREGOE APPROACH TO PROBLEM SOLVING. In 1965 Charles H. Kepner and Benjamin B. Tregoe wrote a book, The Rational Manager: A Systematic Approach to Problem-Solving and Decision Making, that documented the problem-solving approach they had developed. They updated this work in 1981 with the publication of The New Rational Manager, to reflect the latest developments in their approach. The Kepner-Tregoe approach was in use at more than 3,000 corporations worldwide as of 1981, and had been accepted as a proven approach to problem solving in industry, government, and other applications. In fact, the authors detailed the use of their problem-solving approach by the National Aeronautics and Space Administration (NASA) to successfully diagnose the problems encountered by the Apollo 13 astronauts and bring about their return. NASA personnel credited the Kepner-Tregoe approach with enabling them to discover the cause of the problem and find a solution under extraordinary time pressure with no tolerance for mistakes and no second chances available. The Kepner-Tregoe approach covers stages one through five of the problem-solving process. The components of the Kepner-Tregoe approach are: situation appraisal, problem analysis, decision analysis, and potential problem analysis/potential opportunity analysis. Situation appraisal entails organizing and clarifying complex situations as well as identifying problems or concerns, establishing priorities, and devising measures to solve problems or address concerns. In addition, situation appraisal also requires determining the key personnel to be involved in implementing the solution. The primary task of this step is examining the business environment in order to locate potential threats (problems or concerns) and opportunities, which means determining if company standards and goals are not being met, if areas need improvement, if company changes will create problems or opportunities, and so forth. After the problems have been identified, companies must figure out which ones are to be solved first, determine possible solutions, and set up teams to implement the solutions. Problem analysis is used to "identify, describe, analyze, and resolve a situation in which something has gone wrong without explanation," according to Charles Kepner. The process uses cause-and-effect thinking to isolate the problem from the confusing mass of detail that usually surrounds problem situations. The concepts of identity, location, timing, and magnitude are used to home in on the cause of the problem's effects. Ultimately, problem analysis involves describing the problem, finding potential causes, evaluating potential causes, and determining the actual cause. Decision analysis is used to examine the purpose behind making a decision, the possible options to achieve that purpose, and the risks for each of those alternatives. Once these factors are outlined, the alternative with the best balance between positive and negative factors can be chosen. Potential problem analysis/potential opportunity analysis is used to analyze the consequences of a decision. If a decision might result in problems or might lead to trouble, this analysis can be used to foresee what could possibly go wrong and to develop measures that could either head off the problems altogether, or could deal with the problems once they actually arise. On the other hand, decisions also might have unforeseen consequences that are beneficial and this analysis helps identify these implications and maximize their effect. This process involves four steps: identifying potential problems or opportunities, determining probable causes, taking action to prevent or promote the causes, and planning action to minimize or maximize the effects. THEORY OF INVENTIVE PROBLEM SOLVING. The theory of inventive problem solving, or Triz, is a small but growing approach to problem solving; it was developed in the 1940s by a patent investigator of the Soviet navy, Genrich Altshuller. This technique largely helps solve problems related to product design, although the principles have been transferred to other areas as well. At the foundation of the theory is the idea that the solution to 90 percent of all engineering problems can be found in other disciplines where the problems have already arisen. While researching patents, Altshuller discovered a pattern of innovation, which he believed could be applied to any problem. The Triz problem-solving technique requires engineers to have knowledge of 39 engineering parameters and 40 principles of invention, according to Rochelle Garner in Electronic Business Today. These parameters and principles derive from Altshuller's study of 1.5 million patents worldwide and are used repeatedly in the problem-solving process, according to Altshuller. Triz also rests on the principle that inventions require overcoming contradictions. For example, if an auto manufacturer decides to increase the thickness of a car's body in order to enhance its durability, the car will become less efficient as a result of the added weight. When using Triz, problem solvers identify the parameters they want to use and enhance and the parameters they want to bypass, and arrange them along the X and Y axes to create a contradiction table. The intersecting parameters will provide problem solvers with new ideas for overcoming their obstacles. In addition, Triz involves seeking solutions in outside disciplines. For example, removing shells from sunflower seeds, cleaning filters, and splitting diamonds along natural fractures can all be done using the same technique: placing these items in sealed chambers, increasing the pressure, and then suddenly decreasing the pressure. Like other problem-solving methods, Triz begins by identifying the root of the cause and eliminating apparent causes. Then using the engineering parameters and inventive principles as well as contradiction tables, problem solvers review how other disciplines have confronted similar problems and develop potential solutions. Finally, the most effective solution given company needs, goals, and resources is selected, evaluated, and implemented. THE THEORY OF CONSTRAINTS THINKING PROCESS APPROACH. The most complete and most advanced problem-solving style yet developed to solve complex problems is the logic-based theory of constraints thinking process. It encompasses all six of the stages of the problem-solving process. Although most of it is based on commonly known methods from the field of informal logic that began in the 1970s, this approach has much to offer as an integrated set of techniques that can be used to solve the most complex and difficult-to-grasp problems. It offers a means of creatively breaking through a seemingly unsolvable problem and then evaluating the solution to make sure that positive results occur and any negative results are avoided. For any system, the constraint is defined as anything that limits the system from achieving a higher level of performance relative to its goal. Obviously, this means that the system's goal must be defined before the constraint can be identified. Constraints can be either physical or nonphysical. A physical constraint could be the speed of a machine or the capacity of a vehicle, while a nonphysical constraint could be a policy or procedure based on someone's way of thinking. The five-step improvement process described above is oriented toward solving problems in a system with physical constraints. If the constraint in a system is nonphysical, however, such as a policy that has outlived its usefulness, the five-step process above should be replaced by the five-component thinking process. The five components are: the current reality tree, evaporating cloud, future reality tree, prerequisite tree, and transition tree. The current reality tree is used to diagnose the core problem from its symptoms by using a form of cause-effect logic flowcharting. The evaporating cloud approach is used to creatively develop potential solutions to problems that seem intractable. The future reality tree is used to identify the results of the potential solution, both the positive results hoped for and the negative consequences that otherwise would not be anticipated and headed off. The prerequisite tree is used to overcome obstacles that stand in the way of accomplishing the solution. The transition tree is a logical form of implementation plan for carrying out the solution. In developing a current reality tree, a list of symptoms that apply to a specific problem situation is developed. From this list of symptoms, called undesirable effects, one of the symptoms is chosen as a starting point. For this effect, its immediate cause is hypothesized, and the relationship is shown with an arrow connecting the statement of the cause to the statement of the effect. It is read in the following fashion: "If the cause, then the effect." This cause-effect relationship can be confirmed, if need be, by looking for another effect from the same cause. If this effect is observed, this tends to confirm that the cause-effect analysis is aimed in the right direction. If the effect does not occur, this is sufficient to disconfirm the original cause-effect hypothesis, and indicate that the analysis should aim in a different direction. Why Don't People Work Together in Organizations? sufficient to result in the effect by itself. In Figure 3, note the effect of inappropriate performance measurements on the behavior of people in organizations. de Bono, Edward. New Think: The Use of Lateral Thinking in the Generation of New Ideas. New York: Avon Books, 1971. Dettmer, William H. The Theory of Constraints: A Systems Approach to Continuous Improvement. Los Angeles: University of Southern California, 1995. Garner, Rochelle. "Triz of the Trade." Electronic Business Today, September 1997, 72. Goldratt, Eliyahu M. It's Not Luck. Great Barrington, MA: North River Press, 1994. Gordon, William J. J. Synectics: The Development of Creative Capacity. New York: Harper, 1961. Kepner, Charles Higgins, and Benjamin B. Tregoe. The New Rational Manager. Princeton, NJ: Princeton Research Press, 1981. Koestler, Arthur C. The Act of Creation. London: Hutchinson, 1964. Noreen, Eric, Debra Smith, and James T. Mackey. The Theory of Constraints and Its Implications for Management Accounting. Great Barrington, MA: North River Press, 1995. Osborn, Alexander Faickney. Applied Imagination: Principles and Procedures of Creative Thinking. Rev. ed. New York: Scribner, 1957. Prince, George M. The Practice of Creativity: A Manual for Dynamic Group Problem-Solving. New York: Collier Books, 1972. Schoennauer, Alfred W. W. Problem Finding and Problem Solving. Chicago: Nelson-Hall, 1981. Spitzer, Quinn, and Ron Evans. Heads, You Win! New York: Simon & Schuster, 1997. ——. "New Problems in Problem-Solving." Across the Board, April 1997, 36. Von Oech, Roger. A Whack on the Side of the Head: How to Unlock Your Mind for Innovation. Menlo Park, CA: Creative Think, 1983. Watzlawick, Paul. Change: Principles of Problem Formation and Problem Resolution. New York: Norton, 1974. Zwicky, Fritz. Discovery, Invention, Research through the Morphological Approach. New York: Macmillan, 1969.